A new episode of the screencast series is now available at the OpenNebula YouTube Channel. This screencast demonstrates the new ability to import existing VMS from all the supported hypervisors. 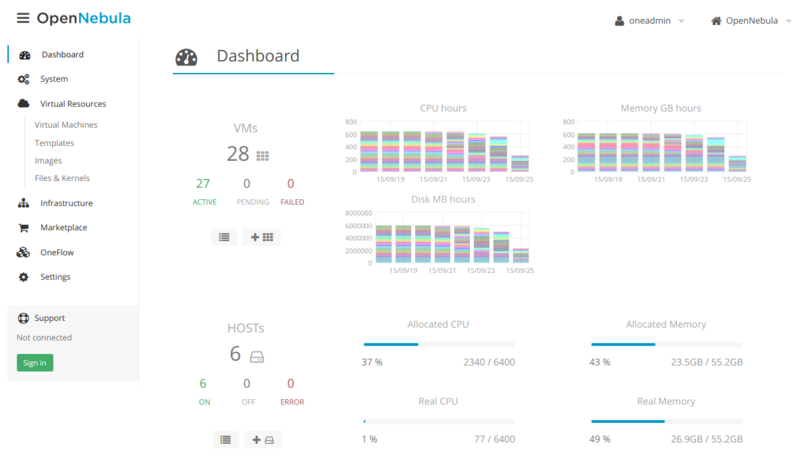 The monitoring mechanism in OpenNebula reports all VMs found in a hypervisor, even those not launched through OpenNebula. 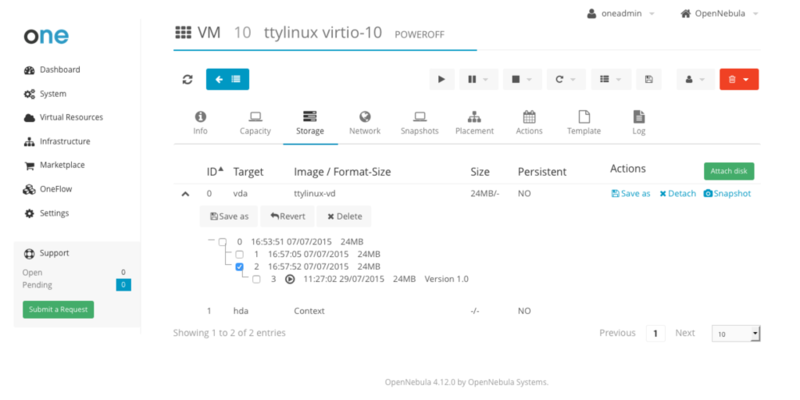 These VMs are referred to as Wild VMs, and can be imported to be managed through OpenNebula. This includes all supported hypervisors, even the hybrid ones. After a Virtual Machine is imported, their lifecycle (including creation of snapshots) can be controlled through OpenNebula. OpenNebula 4.14 is out, and it comes with lots of big and small improvements. In this post we want to showcase a brand new feature you may have missed from the release notes: disk snapshotting capabilities. Now VM disks can be reverted to a previous state at any given time, and they are preserved in the image if it is persistent in the image datastore. For instance, you can attach a disk to a VM, create a snapshot, detach it and attach it to a new VM, and revert to a previous state. The following video contains a quick demo, check it out! OpenNebula 4.14 ‘Great A’Tuin’ is Out! The OpenNebula team is pleased to announce the immediate availability of the final version of OpenNebula 4.14, codename Great A’Tuin. One of the main focus of this release has been the Sunstone interface, which has been completely refactored for maintenance and performance reasons. Expect major improvements in Sunstone from now on. Also, we are sure you will like the subtle changes in the look and feel. To support HPC oriented infrastructures based on OpenNebula, 4.14 enables the consumption of raw GPU devices existing on a physical host from a Virtual Machine. There is no overcommitment possible nor sharing of GPU devices among different Virtual Machines, so a new type of consumable has been defined in OpenNebula and taken into account by the scheduler. VMs can now request a GPU, and if OpenNebula finds one free resource of type GPU available, it will set up the VM with PCI passthrough access to the GPU resource, enabling applications to get the performance boost of the direct access to a GPU card. OpenNebula users managing vCenter infrastructures will also benefit from this upgrade. The workflow of the VM importing feature has been greatly improved through Sunstone, making it easier to import your existing workload into OpenNebula. Moreover, 4.14 adds the possibility to instruct OpenNebula whether or not it should save the disks, protect your users against accidental data lost! Last, but not least, a contextualisation improvement now allows to directly pass scripts to be executed in boot time to vCenter VMs, increasing the flexibility in VM customisation from OpenNebula in vCenter. Also new in 4.14 is the ability to create and maintain a tree of VM disks snapshots. Now VM disks can be reverted to a previous state at any given time, and they are preserved in the image if it is persistent in the image datastore. For instance, you can attach a disk to a VM, create a snapshot, detach it and attach it to a new VM, and revert to a previous state. Very handy, for instance, to keep a working history of datablocks that can contain dockerized applications. This is a stable release and so a recommended update. It incorporates important improvement since 4.12 and several bug fixes since 4.14 Beta2. Be sure to check the compatibility and upgrade guides. We invite you to download it and to check the QuickStart guides, as well as to browse the documentation, which has also been properly updated. If you want to take OpenNebula 4.14 for a quick test drive, take a look at the different SandBoxes. Disk snapshots with Ceph backend was funded by Unity. Qcow2 snapshots implementation was funded by BIT.nl. GPU devices support was funded by SURFsara. Flexible network attributes definition in contextualization was funded by Université Catholique de Louvain. The OpenNebula project would like to thank these organizations and the community members and users who have contributed to this software release by being active with the discussions, answering user questions, or providing patches for bugfixes, features and documentation. https://opennebula.org/wp-content/uploads/2018/11/opennebula_cloud_logo_white_bg-4.png 0 0 Tino Vazquez https://opennebula.org/wp-content/uploads/2018/11/opennebula_cloud_logo_white_bg-4.png Tino Vazquez2015-09-28 11:57:432015-09-28 11:57:43OpenNebula 4.14 ‘Great A’Tuin’ is Out! OpenNebula Systems, the company behind the OpenNebula project, have just announced a new pricing plan for OpenNebula Support Subscriptions. With the new plan, the aim is to be as easy to work with as possible, including complete transparency about pricing, no complicated plans, lower cost, and a maximum cost per OpenNebula instance (“zone”) that is achieved beyond 50 servers in Xen/KVM clouds and 5 vCenter instances in VMware clouds. This avoids having to track and manage individual server or vCenter instance count enabling you to take advantage of the elastic nature of cloud, especially as you scale your infrastructure. Many of our existing customers will see a reduction on their next renewal. You can now buy a Basic Support Subscription for a single OpenNebula instance and an unlimited number of servers, VMs, CPUs and cores for only €12.000 euros ($15,000 in USA). OpenNebula is completely vendor-neutral and without hype, with a strong focus on real-life needs, developing the best technology, and serving users. We love open-source and take pride on being an open-source company. There is only one completely free, fully open source, OpenNebula software. We do not develop proprietary extensions that lock you in. We hope the new pricing plans make it even simpler to setup your perfect open cloud environment with commercial support, based on your favourite Cloud Management Platform! Our support subscriptions bring many benefits but the main one is that they help support the OpenNebula open-source project. We want to thank all our customers for their confidence in us. Stay tuned and as always, let us know what you think! We are happy to announce that OpenNebula is sponsoring the CentOS Dojo Barcelona 2015, co-located with OpenNebulaConf. The event will take place from 13:30 to 18:30, Tuesday October 20th, in the Hotel Barceló Sants, in Barcelona, Spain. Besides attending the Dojo itself, you are very welcome to acquire an entry for the Tapas dinner that will happen that night with the OpenNebulaConf2015 attendees. A perfect place to network and have fun! Note that all OpenNebulaConf2015 attendees have a free entry to the Dojo, you only need to acquire the specific ticket for OpenNebulaConf attendees in the Dojo Eventbrite page. As you already know, here at OpenNebula we enjoy a lot participating in CentOS Dojos, as it brings people together, they’re fun, and one has the opportunity to belong to an ever-growing ecosystem. We are sure you will enjoy it a lot, come join us! OpenNebula 4.14 ‘Great A’Tuin’ Beta2 is Out! The OpenNebula project is proud to announce the release of OpenNebula 4.14 ‘Great A’Tuin’ Beta2. This Beta release introduces features not present in Beta1, like like for instance better support for Qcow2 and GPU support for VMs. To support HPC oriented infrastructures based on OpenNebula, 4.14 also enables the consumption of raw GPU devices existing on a physical host from a Virtual Machine. There is no overcommitment possible nor sharing of GPU devices among different Virtual Machines, so a new type of consumable has been defined in OpenNebula and taken into account by the scheduler. VMs can now request a GPU, and if OpenNebula finds one free resource of type GPU available, it will set up the VM with PCI passthrough access to the GPU resource, enabling applications to get the performance boost of the direct access to a GPU card. The OpenNebula team is now set to bug-fixing mode. Note that this is a beta release aimed at testers and developers to try these new features (not production environments) and send a more than welcomed feedback for the final release. https://opennebula.org/wp-content/uploads/2018/11/opennebula_cloud_logo_white_bg-4.png 0 0 Tino Vazquez https://opennebula.org/wp-content/uploads/2018/11/opennebula_cloud_logo_white_bg-4.png Tino Vazquez2015-09-09 14:53:382015-09-09 15:46:18OpenNebula 4.14 ‘Great A’Tuin’ Beta2 is Out! Next 12-15 of October, just one week before OpenNebulaConf 2015, a major event in the virtualization world will take place in Barcelona, Spain. We are talking about the VMworld 2015 Europe, a must attend event where almost everyone with an interest in cloud computing and virtualization will be networking with industry experts. The OpenNebula team will be present in the VMworld with a booth dedicated to show demonstrations of OpenNebula and the vCenter drivers, as well as vOneCloud, the open source replacement for VMware vCloud. If you are going to be around Barcelona next month, make sure you attend the event and come round our booth, NI4040 (near in the entrance, left of the Intel stand). There you will be able to see first hand how a VMware based infrastructure can be managed using your favourite, purely open source technology, OpenNebula. Check this Newsletter to find out the what kept us busy this month, including the latest developments and events of the OpenNebula project and the community during this last month of August, and the plans for the upcoming months. We would like to remind you that the third OpenNebulaConf, due in October in Barcelona, is around the corner! You are still in time until the 8th of September for the early bird discount. August warm haven’t had an impact on the dev team! No slugginesh after the release of the first Beta of OpenNebula 4.14 ‘Great A’Tuin’. We want to thank our community for the excellent feedback on this important release, packed with features. It is of the utmost importance to fine tune OpenNebula, so thanks! As mentioned, the team has not been drowsy at all. A few more features are currently being polished to make their debut in ‘Great A’Tuin’. For instance, the ability to resize an existing disk for all the supported OpenNebula backends. If your VM needs more disk space than the one provided by the images used for its disk, you can now set a new size prior to instantiate the VM, OpenNebula will grow the disk and the guest OS will adapt the filesystem to the now bigger disk at boot time. OpenNebula cloud admins can now maintain a VM Template catalog with different disk sizes without the need of cloning and storing the same disk with different sizes. Another great addition for 4.14 is the support of GPU access from Virtual Machines. This is great news for HPC and science clouds, since virtualized applications can get now the performance boot of the direct access to a GPU card. Also, the team has worked in stabilizing the previous and exciting new features: qcow2 and Ceph snapshots (live in the case of qcow2), Sunstone refactoring, importing running VMs, the possibility to cold attach disks and network interfaces to powered off machines; improvements in accounting to keep track of disk usage (with the ability to control disk consumption through quotas); better logging in several areas; the ability to pass scripts to VMs for guest OS customization; and many others. OpenNebula community keeps at it even during the estival season. For instance, working on supporting the latest versions of OpenNebula stable in your favorite linux platforms, directly from their repositories. A good example of this is the new packages for Debian unstable. It is always nice to see OpenNebula being adopted, but if the deployment is within an institution as prestigious as Harvard University, the is double the fun! We are sure OpenNebula will meet their expectations and we are thrilled about the feedback they will surely provide. A good example of how vibrant the OpenNebula community is can be seen in the fact that its ecosystem doesn’t stop to grow! A new OpenNebula storage driver for Saturnring open-source scale-out iSCSI-based block storage is most welcome and very useful addition. Thanks! The upcoming third edition of the OpenNebulaConf will be held in Barcelona this October 2015. The Conference is a great opportunity to meetup and share your OpenNebula experiences with the community. 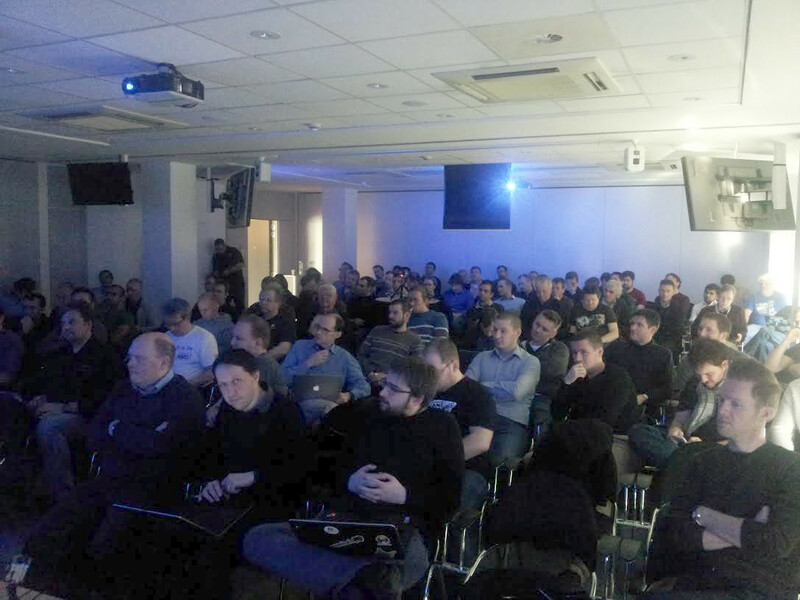 Your company may be interested in the sponsorship opportunities for OpenNebulaConf 2015. We would like to take this opportunity to also thank our Platinum Sponsors PTisp and StorPool; Gold Sponsors ungleich, Xen Server and NodeWeaver; and Silver Sponsors Runtastic and No Limit Network. If your company is interested, you can apply with this form. If you are willing to attend, you are still in time for the early bird discount. Karsten Nielsen from Unity Technologies will give a keynote about how they apply the KISS approach to their federated infrastructure using OpenNebula. Armin Deliomini from Runtastic will tell us the story of their way to transition their private cloud from small to larger scale. The OpenNebula project has been invited to participate in the 2015 BESIIICGEM Cloud Computing Summer School in Beijing, aimed at training a number of young researchers, spreading Cloud Computing knowledge across the physics computing community. The reference middleware stack of choice for the practical activities will be OpenNebula, chosen for its simplicity and our experience in its use for scientific computing use cases. If you are interested in receiving OpenNebula training, check the schedule for 2015 public classes at OpenNebula Headquarters. Next public OpenNebula training will take place next 15th of September in Madrid. Please contact us if your would like to request training near you.